Please find here a selection of some of our satisfied customers testimonials. South Pacific are committed to supplying quality products and prompt and professional service in all aspects of your building project or renovation, including the selection of the right product, to delivery, installation and after sales service. Simply call to arrange an appointment with one of our qualified and helpful sales team to discuss your requirements. Good afternoon Stratos, late last year your company provided all the windows and doors for our new house at Myrtle Bank our builder was Craigburn Constructions. Back then and subsequently, we have been looked after by Shaun Farmer. It is important to us that you know how highly we regard Shaun, he is super friendly, technically sound and just a pleasure to have his input, we could not rate him more highly. Thank you and regards, Glen and Lisa. In 1990 we built a home using South Pacific Aluminium Windows and Doors. At that time, we were very happy with the quality of the product. Last year (2012) we built again using South Pacific’s Commercial Grade Windows and Doors. Apart from the attractive profiles and quality of the windows and doors, we found the service provided by the company’s principals and the whole team, from the office staff to the installers was excellent in every way. We are both very happy with the final result. Thank you, Sue and Charles. Good morning Stratos, we realise that your company is focussed on the “high end” of the market based on the many outstanding building projects displayed in your showroom and in magazines but we were both impressed by the quality and more so your assistance and advice in the final selection of the doors. Dear Spiro and Jim, we have just had all our windows replaced and I would really just like to say a BIG thank you to everyone involved especially Richy, Chris and Kenny. Richy for helping us with our quote and advice on which windows would be best for the rooms we were dealing with and Chris and Kenny for their expertise and complete work ethics. They were always on time, very friendly, helpful and didn’t cut any corners where they had the chance and did an exceptional job. I would have absolutely no problems with totally recommending South Pacific Windows and Doors to any of my friends or associates and I would like to suggest a pay rise for the boys! Hi Jess, thank you so much for organising the guys to come out on Friday and Sunday. I also have to mention that Nick and Grant were two “great blokes”. They were very polite and sensitive towards my mum when installing her Sliding Door, prompt and efficient in their work and accommodating of the dogs. They really were fantastic and a great reflection on your company. Please pass on our thanks, Ayesha. Thanks for a job well done, RRC. Can you pass on my thanks for the great job South Pacific did on my new front door to all involved. Always great to deal with prompt, professionals! Thank you for your service, we are very impressed with overall look and workmanship of our windows and doors. Kind regards, P & W.
Thank you Gloria, the installation of all the windows and doors was exceptional and the service from all the team was terrific. We have just had every window in our 36 year old home replaced by South Pacific Aluminium Windows and Doors. After having 5 different style windows due to additions and renovations over the years, the transformation is incredible. Our home looks new again. We are very pleased with the quality of the products and the manner in which Gary went about these renovations. I would have no hesitation in recommending South Pacific to anyone. Thanks again for a great installation, N & B. The job looks great and I have taken a few before and after photos that I will send a bit later when I am organised. Could you pass on our thanks to Jess (for her help with a few queries from the client) and also to Nick and Grant for their advice and who made the job look fairly straight forward, which it wasn’t! Thank you, R & E.
We are extremely impressed with the quality of the windows and the way they enhance our property. We also wish to express our sincere thanks to the installer. He has done a very professional job and his friendly attitude, manner and service were appreciated. He was very thorough in every way and he also tidied up a window frame for us which we were unable to do ourselves. He is a talented tradesman. We would happily recommend your company and product to others. Thanks for your service and a job well done, Karen. We would like to pass on a vote of appreciation for the excellent work of your installer, Gary. We were most impressed with his attention to detail, and the care he took with the “cleaning up” after the job was completed. Much appreciation, I & A. Your service guy was here today and fixed the windows. I just wanted to say they look terrific and we are very happy with them. Many thanks for all your help, Maggie. Very pleased with the work done and the finished product. My thanks to you and the team there, Lynton. In choosing South Pacific I was impressed by your very fine showroom display which gave me every confidence that your workman paid special attention to detail. Jim, I am thrilled with my new windows and would like to thank all the workman, especially Gary for doing such a good job. Also the friendly receptionist. I am writing to tell you what a pleasure it was dealing with your Company. Not only was the quality of your windows and installation excellent, but the staff I dealt with were very helpful and friendly especially Jim, Jess and Gary. We would like to express our satisfaction with the make and installation of the windows. Gary has done an excellent job and has taken real care not to inconvenience us during the process. We asked for a good job and we had what we consider very good workmanship. With thanks, G & C.
Jess, I chose you guys because I know you have the best quality product by far and I can say that your attitude in dealing with the deposit return has GUARANTEED you will be the only Window and Door company we ever deal with as a family. Hello Stratos, I was at the Home Ideas Centre and in your showroom when I noticed the skirting boards you have used. Would you be kind enough to give me your supplier’s name? 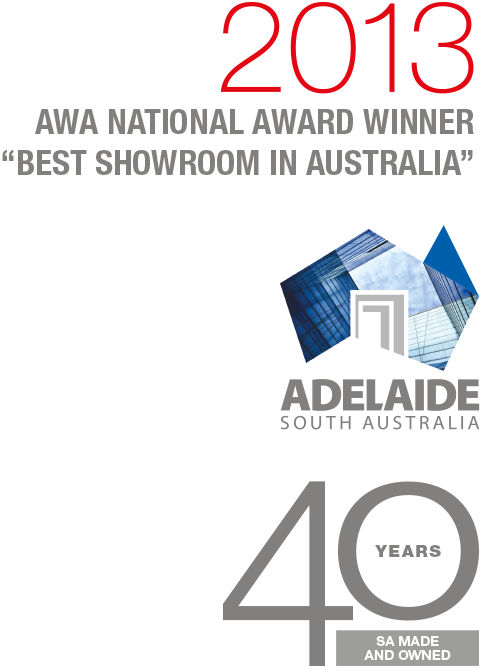 You have the best showroom in Adelaide and great staff too. Dear Sir, your company recently installed a sliding door and security screen at our home, the quality, service and installation were of the highest standard. Originally we attempted to obtain three quotes for the work. The first company we rang said they would return the phone call, but we never heard from them. The second company sent a representative who was unable to provide any quote on the spot, but said he would have a quote to us by the end of the week. Two months later we never received a quote. We contacted your company third, (a referral from Dickson Glass) and an appointment was arranged. The representative appeared on time, was helpful and indicated a quote would be received within a day or two. We received the quote within a few days and after giving up on the other companies accepted the quote. The next appointment was made for precise measurements to be taken and the rep arrived punctually. The products were manufactured and delivered promptly and the installation was carried out, again on time and to our satisfaction. As I needed to take time off work on every occasion I was pleased that every appointment was kept at the time stated. Every rep we dealt with from the receptionist to your installers was courteous and knowledgeable, a rare event these days. I would be pleased if my thanks could be relayed to all concerned.